6 Pairs of WSD Merino Wool Socks for Women, Soft Warm Thermal Sock, Moisture Wicking at low wholesale prices. Socksinbulk.com offers Womens Thermal Socks at bulk discounted prices. 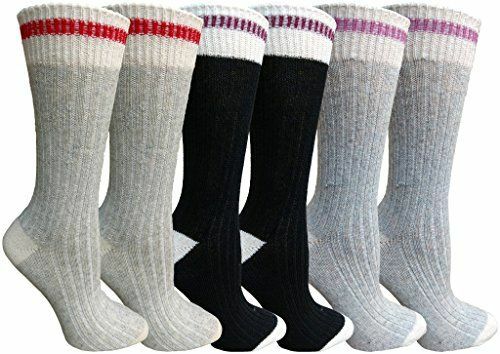 WOMENS WOOL SOCKS: A fine blend of warmth and fashion, these heavy ribbed twisted yarn wool socks comes in a variety of stunning colors in a single pack. Designed with style in mind, these socks are functional as they are stylish, featuring a warm heavy knit to brave all weather conditions. HIKING / SKIING / CASUAL THERMAL SOCK: Perfect for a wide range of activities from casual day to day wear and winter sports including skiing, snowboarding, sledding, and taking on the great outdoors. Great for hiking, walking, running, trekking, cycling, and other athletic purposes.These lightweight socks have antimicrobial properties that fend off germs and odors. MOISTURE WICKING / SOFT TOE SEAM: These wool socks provide a unique set of properties making it the ideal sock for most activities and almost any occasion. Features a natural moisture wicking ability to help draw moisture or sweat away from the skin, keeping them dry and comfortable. Each sock has a soft toe seam for comfort through hours of wear. TWISTED YARN CONSTRUCT: The twisted yarn construction ensures structural integrity especially with frequent wear. 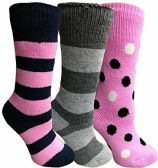 The durable socks are perfect for various uses and looks chic with almost any outfit. These itch-free socks keeps your feet cozy and can be worn in all seasons. Keeps your feet cool in warmer weather with optimal breathability. COMFORT FIBER BLEND: Sock size 9-11 will fit ladies shoe sizes 5-10. Made with 30% Wool, 50% Cotton, 18% Polyester, 2% Spandex. Made with high quality fibers on modern machinery for a comfortable fit and durable construction. Includes pink, tan, heather gray, and dark gray. This bulk pack is a perfect treat for yourself or a gift for a loved one or friend. These thermal socks feature thermo-insulating technology that keeps heat close to the body. 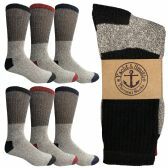 Wool socks are great for hiking skiing, camping, hunting, and many other outdoor activities. These hiking socks feature reinforced heel for added comfort and durability. Extra cushion on the bottom provides arch support. 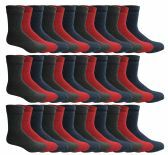 These wool hiking socks are made with 35% polyester, 35% cotton, 20% wool, 5% acrylic, and 5% spandex.